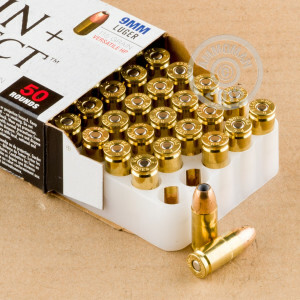 It’s not a wholly bad plan, loading cost-effective ammunition into your everyday carry while training at the range, only to put more expensive hollow points in it while you’re going about your daily business. The big drawback to that course of action, however, is that the two types of ammunition perform significantly differently in the same firearm. To be most effective with your weapon, you want to become intimately familiar with the performance it will deliver when you have to draw it in self-defense. Federal knows this, so they offer their Train + Defend line of ammunition. This 9mm cartridge features a 115 grain versatile hollow point bullet. Since it’s easy on the wallet, you can train with it to your heart’s content, but because it’s also very effective against human-sized assailants you can confidently keep it loaded for personal protection. The bullet’s strong jacket ensures penetration, even through thick cloth, and its hollow point provides the expansion needed to take down foes quickly. This round further features a non-corrosive primer and factory fresh brass casing, the stuff needed for handloading. 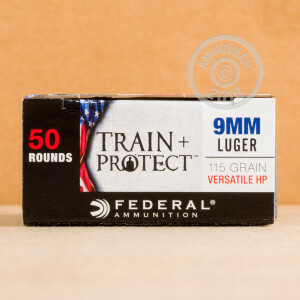 With 500 of these rounds at your fingertips you can be ready for most anything.